Former Secretary-General of the United Nations Ban Ki-Moon spoke to the Gazette about his tenure at the helm of the U.N. and his global concerns going forward. After 10 years as secretary general of the United Nations, Ban Ki-moon, M.P.A. ’84, stepped away from the international stage at the end of last year. The onetime South Korean foreign minister remains active on global issues, including as the Angelopoulos Global Public Leaders Fellow at the Harvard Kennedy School this spring. The fellowship marks a return for Ban, who earned his graduate degree at the School as an Edward S. Mason Fellow. His current role involves meeting with students and collaborating with scholars, as well as lecturing, writing, and participating in public forums. The Gazette recently spoke to Ban about some of the many issues that occupied him during his decade at the helm of the U.N., from the Syrian civil war and the refugee crisis to efforts to combat global warming and promote human rights. GAZETTE: Your 10 years as secretary general were marked by wars, as we know, in Syria, Yemen, Mali, Libya, and the Central African Republic; the rise of ISIS; and Russian intervention in Ukraine. Did your experience leave you more or less hopeful about the U.N.’s ability to prevent and halt military conflicts? BAN: The work of the secretary general of the United Nations, in principle, should always be based on hopeful expectations. Therefore, I always tried to motivate the people and motivate myself to work for a better future. Of course, we are seeing still so many fires burning. Regrettably, I had to leave many unfinished challenges behind to my successor. But basically I’m hopeful that we will be able to resolve all these problems. If and when the member states are united, we can deliver and we can solve all these problems. But unfortunately we have seen on many occasions that the member states have been divided. If not the United Nations, where and how can you find such a universal, legitimate organization in the world? Of course the United States is the most powerful, the most resourceful country, but not a single country or person, however powerful, however resourceful, can do it alone. We have to unite all our political will to resolve all these political and humanitarian issues. We have more than 65 million refugees now. We have so many refugees because of war in Syria, because of crises in many parts of the world, because of abject poverty, because of political instability, because of xenophobia and extremism. We have to be very, very compassionate to help them. GAZETTE: One of the crowning achievements of the U.N. during your tenure was the signing of the Paris Agreement in 2015. Are you concerned the progress being made against global climate change could be undone by the potential U.S. retreat from that cause under the Trump administration? BAN: That’s one of the sources of concern, not only for myself but the United Nations and worldwide. The United States is the second-largest greenhouse gas-emission country, but with the most resources to cope with this climate change phenomenon. It has played a leading role, together with China, on this issue. I as the secretary general invested the largest amount of my time and energy raising awareness of the urgency and importance of mobilizing all political will and all resources to address this issue. That is why I visited most of the front lines of the climate change phenomenon, where I could see with my own eyes the consequences of climate change, starting with Antarctica, twice to the North Pole, and the Amazon River basin. Recently we have seen so many events of extreme weather patterns, such as tsunamis. These are all caused by human behavior. I know that President Trump has made that kind of a comment [questioning global warming], but at the same time I know the closest aides to the president, in the White House even, have said it is important for the United States to be bound by this agreement. And now major big cities and states like California, Washington, and Massachusetts are pursuing their own implementation process. So it’s an imperative that the whole world’s people and governments must implement this Paris Agreement. GAZETTE: You were a forceful advocate for protecting and promoting the rights of women and girls. Do you see overall world progress in that fight? BAN: The United Nations during my time as secretary general made tremendous efforts and made progress to shatter this glass ceiling. Of course, there is still much work we have to do. As secretary general, I thought that I should lead by example. So in 2010, I integrated all small and medium-size women-related departments into one big, super-big organization called U.N. Women. The number of women senior advisors appointed during my 10 years is much more than all the senior women appointed by my seven predecessors. I also appointed the first woman peacekeeping-force commander. When I began, there were 10 countries in the world where not a single woman was represented in parliament. I think four countries still remain on the list. There are also eight countries where there is not a single woman cabinet minister. I reached out to kings, presidents, and prime ministers, saying that you should change this situation. I’m sure that my successor will continue to do that. GAZETTE: Are you optimistic that the current military action against ISIS in Iraq, Syria, and Libya will lead to any meaningful reduction in terrorism? BAN: I am grateful to those countries, including the United States and countries of coalition, that are committed to deter and fight against extremists like ISIS and terrorists. We need to do that with a combined political will and military resources. President Barack Obama in February 2015 convened a summit meeting at the White House to counter the violent extremism. At that time, I also raised the point that we also have to counter this extremism. To prevent violent extremism, there needs to be a clear commitment by world leaders that human rights should come first. Whatever complaints and grievances people are making, those must be discussed and resolved through peaceful means. To do that, leadership should engage in good governance: transparency, accountability, human rights, and eliminating abject poverty. There should be no human rights abuses like torture, like arrests without any warrant. All these things have been happening throughout the world, and leaders have not been paying enough attention to the aspirations and challenges and grievances of the people. GAZETTE: Is the rise of populism and anti-globalist sentiment around the world a source of concern for you? BAN: Globalization is, I think, a good phenomenon in the 20th and 21st century. We are living in an era of transformative development, of technology and communication and transportation, so it’s only natural that people move freely across the borders. The problem is that while people are crossing borders, so are diseases, some bad ideologies, or some weapons, and drugs. But we cannot just blame everything that happens on globalization. Look at the case of even 5,000, 6,000 years ago, people were just moving for a better future, a better place. People have been constantly moving, but these days because of the transformation of technologies, we are moving at a faster speed, and so do some bad things. So we have to really coordinate. That’s what the United Nations has been really working on. GAZETTE: Do you see any path forward for ending the war in Syria, and would it necessarily have to involve the removal of President Bashar al-Assad from power? BAN: I regret deeply that during my time I was not able to see the end of this. The Syrian crisis has always been on top of our agenda. But unfortunately there were a lot of divisions among the countries, among the players in the region, in the world. The Syrian people were divided into anti-regime and pro-regime. The divisional powers in the Middle East, they were divided. Then the United Nations, led by particularly the Security Council, was divided — the United States, France, and the United Kingdom versus Russia. In June 2012, we had a joint communiqué that included a provision to establish a transitional government with full executive powers. The interpretation of this one paragraph has been leading to tragic processes over the last six years. The United States and most of the European countries were insisting that Assad must go now, while Russians and the Syrian government that are pro-regime were saying no, Assad should be part of this process. It is totally unacceptable and unfair that so many people have been killed, so many people have had to flee their country because of the fate of one person, Assad. He should have either left early or voluntarily, or give all his power to other people for the resolution of this issue. I’m urging that this Security Council should be united and take very decisive and firm action to provide political guidelines. Then both anti-government or pro-government forces should lay down their arms, and they must protect human lives. 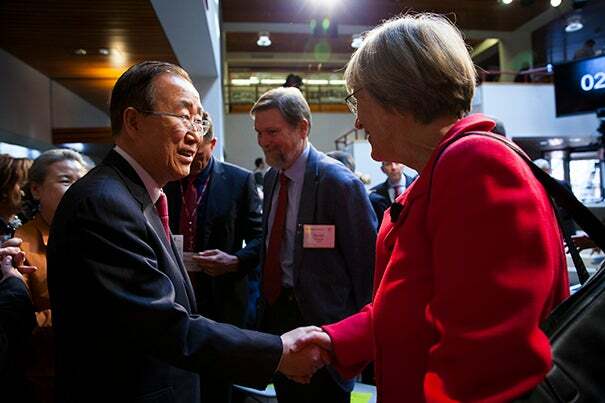 Ban Ki-moon will speak at the Harvard T.H. Chan School of Public Health as part of the “Voices in Leadership” speaker series Tuesday (May 16) at 12:30 p.m. For ticketing and more information, see here. The abrupt firing of FBI Director James Comey has caused much consternation among Democrats and Republicans alike. Alex Whiting, professor of practice at the Law School, talks with the Gazette about the ramifications of Comey's dismissal.